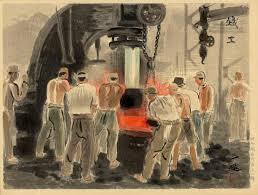 An image from Fra Burmeister og Wain’s Iron Foundry, by Peder Severin Krøyer, 1885. As a result of Shotton’s extended working career I have taken the decision to write two post on his working life. The main body of Ernest Richard Shotton’s memoir is built up of information about his working life and the career he pursued. He worked very hard in many different jobs all through his life. When reading his work you could almost say that E.R.S was the epitome of the working class man. He started his working life at the very early age of 10. At this point in his life he had decided against progressing in his schooling as he had “rather funked entering a new school with fresh boys” (Shotton. E 1963.) He decided to take on a job as an office boy close to his home for 5/- (shillings) a week. For a boy of this young age, this was considered as a rather fair wage. He talks of how he gave his mother some of his wages from the very beginning. Because of the distance of his work place from where he worked, Shotton would not get home during the week until about 9pm and at weekends not until 2.30pm. His hard work, he says is his reason for not participating in sport and hobbies. In 1890 he began working in the cycle trade before he took a job in the spring mattress trade. He acknowledges the dramatic change in jobs in his memoir: “well that was a change in jobs was it not?” (Shotton. E, 21.) At the age of 20, Shotton had already had many different jobs. It was at this point that his brothers asked him to work for them as an office clerk in their iron foundry business. This, you could say was a turning point in Shotton’s career and he decided to take a 5 year course in metallurgy at a technical college. Having achieved this qualification, Shotton realised that he had an invaluable skill and decided to branch off away from his brothers’ business. On telling them this, they offered him shares in their business and he was accepted to Shotton Bros LTD.
All of this part of Shotton’s working life took place before he married C.S in 1906. This part of his working life shows what a proud man he was. He could never have been considered lazy and always did the best that he could to make sure that his family was provided for. 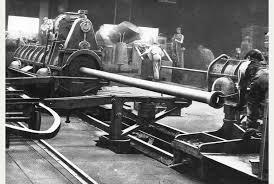 Throughout the early 1900’s work the business fluctuated incredibly, as a result of the wars. The business and Ernest saw many struggles during this time.